Roxanne (Rein) obtained her degree in Accountancy from the De La Salle University in 2007. 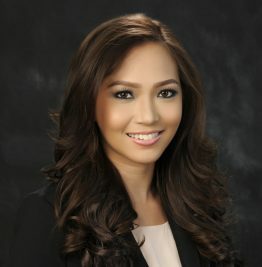 She graduated from the Ateneo de Manila University School of Law in 2012 with honors. She joined C&G Law in 2013. Rein initially worked as a tax accounting consultant from 2007 to 2010 in SyCip Gorres Velayo & Co. She later joined C&G Law in 2013 after obtaining her law degree and has practiced extensively in taxation, labor, mining, and corporate law. Rein handles complicated taxation matters, including tax litigation, dispute resolution, structuring and advisory. Rein’s tax and corporate practice covers all aspects of cross-border commercial transactions, contractual disputes, employment disputes, voluntary corporate dissolution, common law actions including partnerships and shareholders disputes and joint ventures. She represents both domestic and foreign clients before government agencies such as the Bureau of Internal Revenue, Philippine Economic Zone Authority, Securities and Exchange Commission, National Labor Relations Commission, Housing and Land Use Regulatory Board and the Mining and Geosciences Bureau. She also appears before various courts and quasi-judicial bodies such as the Local Board of Assessments Appeals, National Labor Relations Commission, Housing and Land Use Regulatory Board, Mining and Geosciences Bureau, Regional Trial Courts, and Court of Tax Appeals. Rein also advises clients on various issues in relation to Philippine tax laws, which include the efficient structuring of investments and transactions, availment of tax incentives, and tax treaty relief. She also assists clients with tax compliance requirements related to their businesses, complying with audit investigations, protesting deficiency tax assessments, and claiming refunds before the Bureau of Internal Revenue.